Was a Finnish soldier who, using an iron sighted bolt action rifle, amassed the highest recorded confirmed kills as a sniper in any war!! Häyhä was born in the municipality of Rautjärvi near the present-day border of Finland and Russia, and started his military service in 1925. Before entering combat, Häyhä was a farmer and hunter. 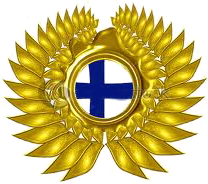 At the age of 20, he joined the Finnish militia Suojeluskunta and succeeded with his sniping skills in shooting sports in Viipuri province. His home was reportedly full of trophies for marksmanship. His duties as a sniper began during the ‘winter war’ (1939-1940) between Russia and Finland. During the conflict Häyhä endured freezing temperatures up to -40 degrees Celsius. In less than 100 days he was credited with 505 confirmed kills, 542 if including unconfirmed kills, however the unofficial frontline figures from the battlefield places the number of sniper kills at over 800. Besides his sniper kills he was also credited with 200 from a Suomi KP/31 Submachine gun, topping off his total confirmed kills at 705. How Häyhä did all this was amazing. He was basically worked solo spending all day in the woods and snow shooting Russians for 3 months straight. Once the Russians began seeing large numbers of causality's they became concerned. But when the Russian commanders were told that it was the work of one man with a rifle they decided to escalate their course of action. First they sent in a counter-sniper. When his body was returned they decided to send in a team of counter-snipers. When they didn’t come back at all they sent in a whole battalion. But after they took heavy casualties, but never found him. The Russians even attempted to use an artillery strikes against him, but to no avail. You see Häyhä was clever, and this was his home turf. He would dress completely in white camouflage. Häyhä used a modified Mosin Nagant rifle used by the White Guard, a M/28 early variant "Pystykorva" (literally Spitz, due to the front sight's resemblance to the head of a spitz-type dog) chambered in 7.62x53R, the Finnish Mosin-Nagant cartridge, because it suited his small frame (1.6 m (5 ft 3 in)). He preferred to use iron sights rather than telescopic ones to present a smaller target for the enemy,and to increase accuracy. This also aided in his concealment. As well as these tactics, He also kept snow in his mouth so his breath did not condense and reveal his position in the cold air. He was also known for compacting the snow in front of the muzzle of his rifle, so as not to disturb it with the muzzle blast, not doing so could also reveal his position. Unfortunately his was shot in the jaw by a stray bullet during combat on March 6 1940. He was picked up by his own soldiers and taken to the field hospital. They remarked about his injuries and said half his head was missing. He didn’t die however, and regained consciousness on the 13th, the day peace was declared.